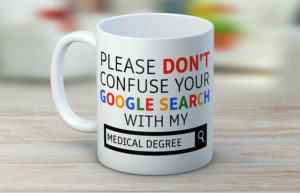 If you want to find a way to insult me, there is THIS mug. I have to be real, I find it’s message quite offensive. Because it deliberately puts a wedge and a divide between me and those who think like me, and the medical profession. It puts an unbearable burden on doctors, nurses and other health care professionals to be “god”. To know it all and take total ownership and complete responsibility for all of our health. As a society we are all about not taking personal responsibility. You know what I mean, just read the news. It’s always someone else’s fault and responsibility. My view is that it’s up to me to look after my family. And yes that means I learn and research stuff, all kinds of stuff. So when I do take responsibility for myself, I am informed. That means I read books either that I order or borrow from the library and do lots of research on line. My health care is MY responsibility. That’s not fair to make it all someone else’s responsibility. . There is so much to know and we each play our part. I see my relationship with my doctor as a partnership. There is middle ground between who takes responsibility for what. In acute care or disease treatment there is nothing like the advice and knowledge of a health care professional. The oncologists, radiologists, nurses and doctors who played a part in the care of my parents were ALL amazing people. Let me be real here. Neither of my parents died in ways that were dignified and pain free. It was torture watching them suffer. The healthcare professionals who surrounded them were incredible and made unbearable situations bearable. I had the GP on speed dial near the end and no matter what time of day I called, the phone was answered. But even here I played my part. I advocated, I watched and I observed my parents. I was there for a lot of the time and the doctor wasn’t able to be there like I was. I was eyes and ears for my parents and I researched all the medication that was prescribed. I KNEW what they were on, the side effects and what the different kinds of medication meant for each stage of the disease. I did not make the GP “god” and we often discussed increasing and decreasing medication. It was a partnership with the doctor as the Captain of the ship. However if you are talking about pro-active health care, I am the Captain of the ship. We are (thank God) a healthy family. Not without issues but our issues are not life threatening (ie acute situations). So I take responsibility. I figure out what we should eat, get genetic tests done, get us assessed when we need it, work out a plan of supplements and essential oils, make sure we all move our bodies and drink lots of water. And of course get rest. This is what I DO. How do I figure this out? I read books, I look at so many websites and I pore over studies on PubMed. Oh and yes, a lot of this is via Google. I have a small team of trusted health care professionals that I surround myself with. All of them respected and honoured. They all have something in common though- none of them have that damn mug or the attitude portrayed in it, on their desks. We are a partnership and I am grateful for them and respect the knowledge they have. I don’t expect them to be “god” and they don’t excuse me from taking responsibility for my own health and the health of my family. Do we always agree? Of course not. That’s where second opinions come in as back to an earlier point, health care professionals are not gods and it’s unfair to expect them to be. But I always offer respect and honour and build bridges wherever I can. I have very good relationships with the health care professionals in my life and some of them have become friends. We don’t have to agree to be on the same page- wanting a whole, healthy and happy life for ourselves and our loved ones. We just need to act with mutual respect.